TOP 10 CHILDREN’S EDUCATIONAL SPACES OF 2016 | "Global Possibilities"
throughout 2016, designboom has covered a wide range of unusual, yet thoughtfully laid out educational establishments for children. 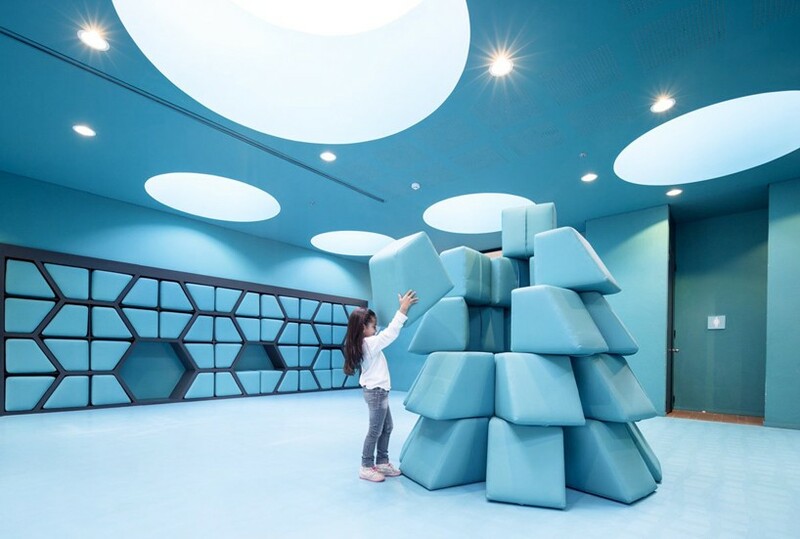 these spaces form stimulating environments that play a vital role in jump-starting children’s learning, creativity, and engagement with others. from a colorfully striped school in singapore, to a monochromatic kindergarten in denmark, take a look at our TOP 10 children’s educational spaces featured over the past 12 months. 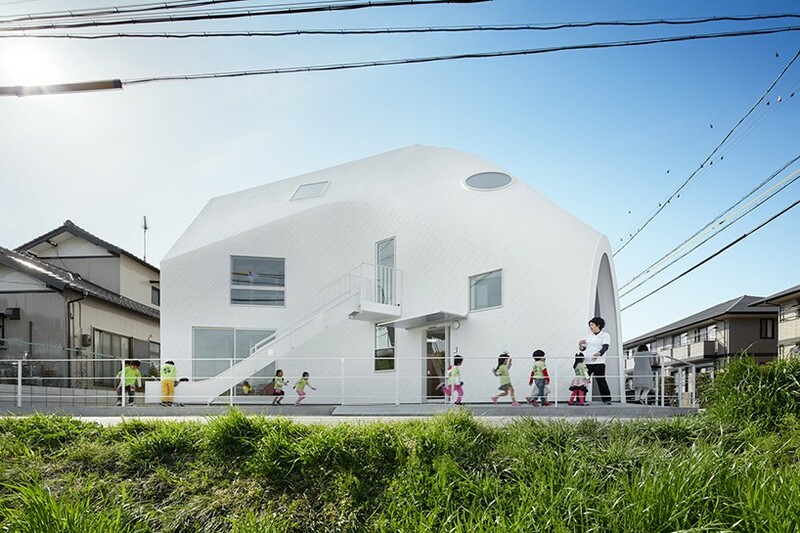 MAD architects’ first project in japan is a sculptural space named the ‘clover house kindergarten’, designed for children in the small town of okazaki. 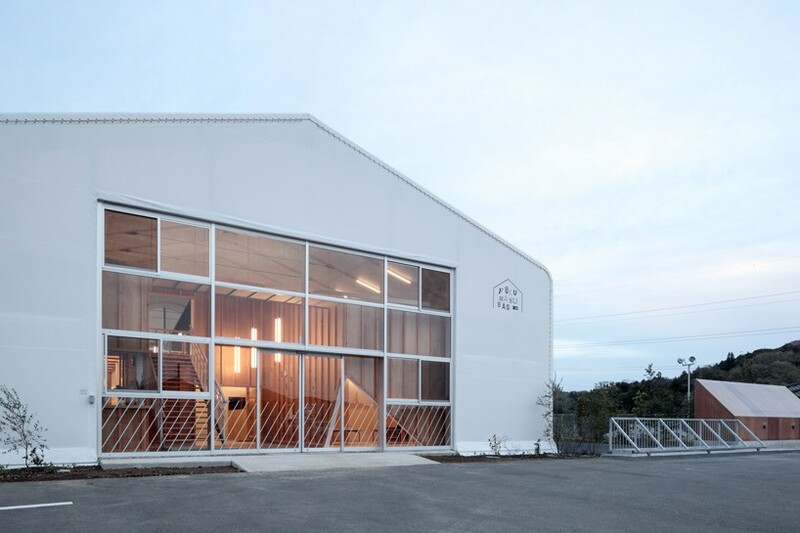 the building was formerly a two-storey residence that had become too small to cater to the needs of its young users. the school’s setting presents views of the paddy fields and mountains beyond, elements characteristic of the aichi prefecture. 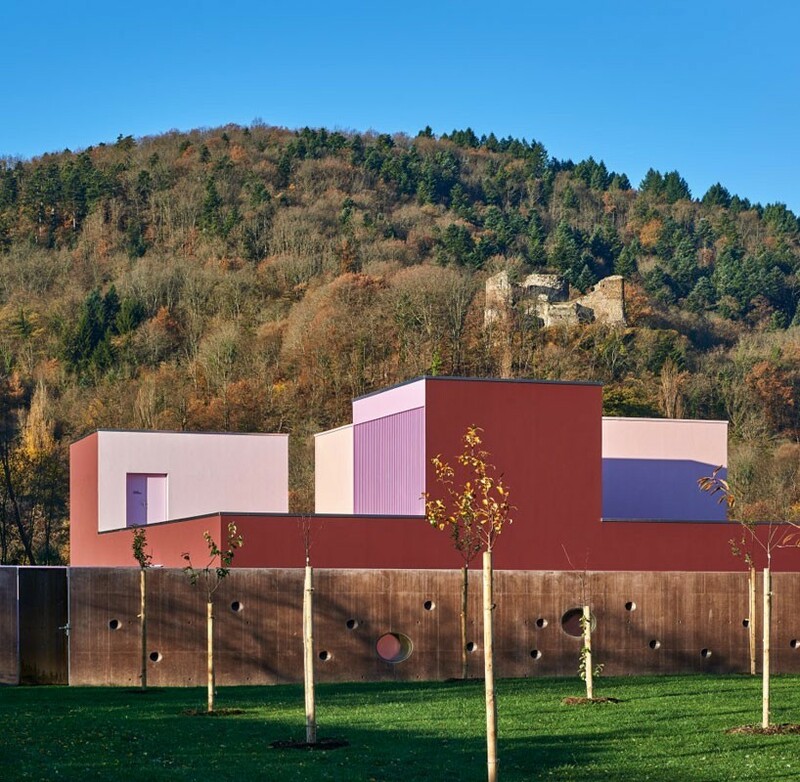 in the french region of alsace, dominique coulon & associés completed a vibrant nursery building described as a distorted ‘lego model of a castle’. appearing as a long volume in pink, red and purple tones, the nursery mimics the orthogonal geometry of the nearby fortified castle. the color palette continues to the interior spaces, where a combination of pinks and reds in matte and glossy finishes define different wall and floor surfaces. 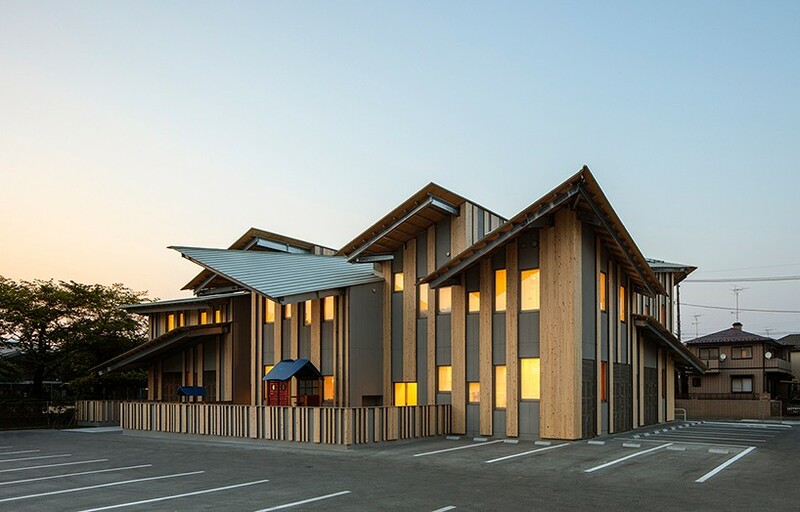 this wood-wrapped kindergarten by feld72 is located in valdaora di sotto, south tyrol. the building forms its own secure boundary, wrapping itself around a playground and communicating an interplay between tradition, contemporary life, and nature. 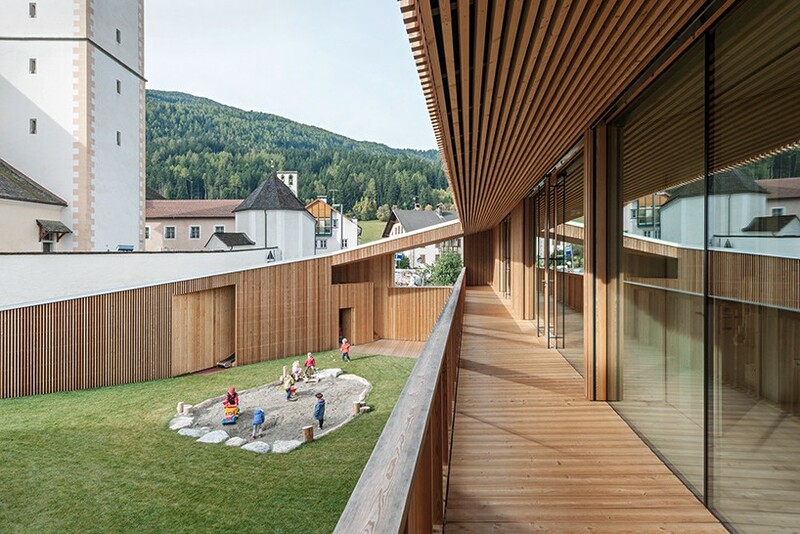 the architectural intervention alludes to the theme of different boundary intensities and, in turn, provides security while allowing the children to run and play freely. conceived as small village setting, the COBE-designed scheme consists of house-shaped volumes with play spaces organized around two winter gardens. this enables a safe and stimulating environment to be created for over 180 young children. breaking away from the traditional, large scale institutional daycare environment, the scheme consists of 11 fragmented, yet connected volumes that ensure a wide range of spaces for the building’s occupants. located in a quaint residential neighborhood in saitama city, ‘aitoku’ accommodates around 150 children with facilities that combine both a nursery school and kindergarten. designed by kengo kuma, the building derives from positioning small house-like volumes together to create one large two-storey building. the verticality of the façade is interrupted by the multiple pitched roofs set at different angles, while the interior features fabric lamps that establish a gentle and comfortable learning environment for children. 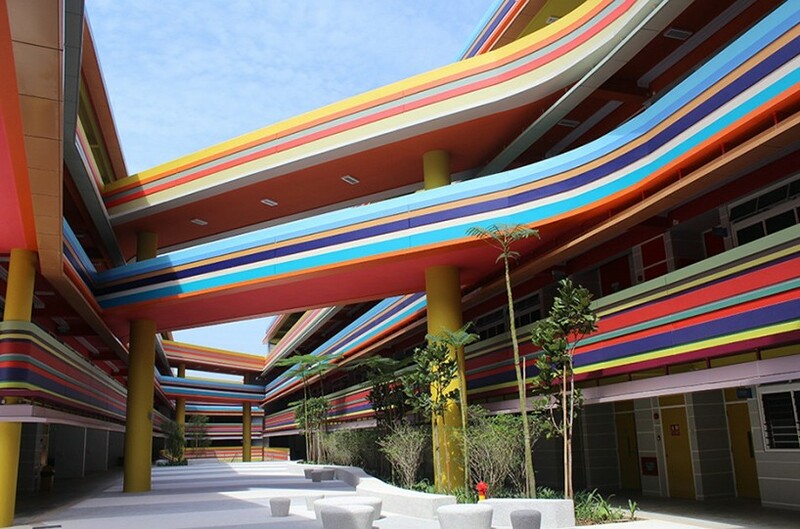 this colorful building in singapore forms a vibrant extension to an existing primary school. designed by australian architecture firm studio505 in collaboration with local practice LT&T architects, the scheme is articulated around a large internalized valley — open to the elements, but oriented away from the surrounding residential streets. in contrast to the colorful exterior, the interior is typically calm in appearance with white walls and ceilings. 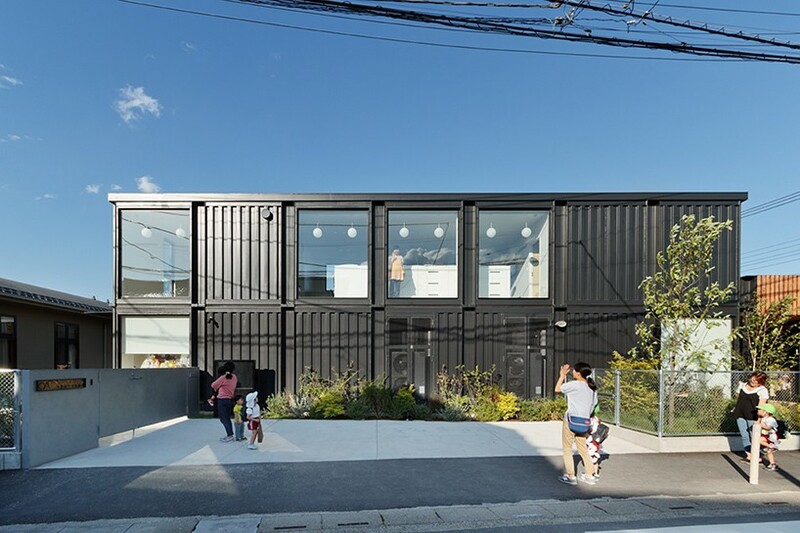 in saitama, japan, HIBINOSEKKEI + youji no shiro renovated this kindergarten using a series of stacked shipping containers. the building has been structurally reinforced to protect it against the threat of earthquakes. 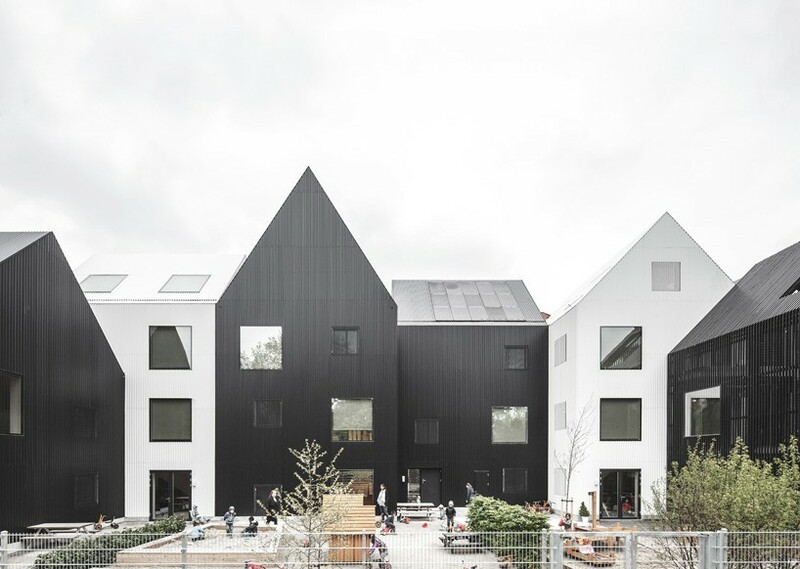 meanwhile, the architects arranged the kindergarten around a centrally positioned courtyard that contains a single tree. here, child care rooms open out onto a sheltered terrace that creates a pleasant outdoor area for recreation. internal spaces are lined with warm timber tones, establishing a comfortable and welcoming learning environment. 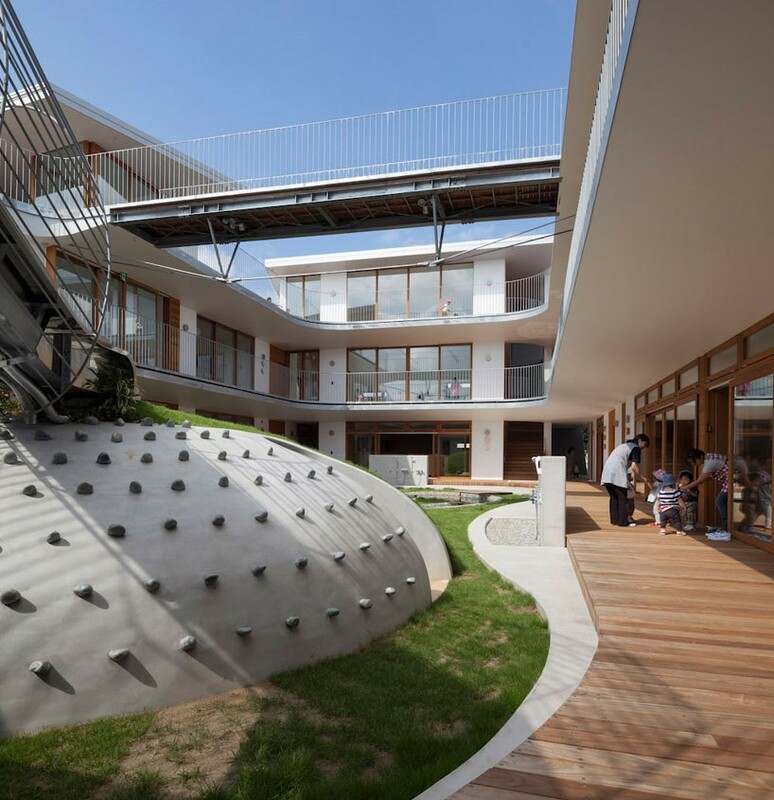 a man-made playground takes center stage in this kindergarten by aisaka architects’ atelier. the 1,000 square meter scheme facilitates 160 children in a secure and generous space. a vegetable garden on the roof and a glass-walled kitchen on the first floor, highlight the importance of incorporating dietary education into the children’s daily schedules to heighten their appreciation and interest towards food. AEI arquitectura e interiores has colorized daniel bonilla arquitecto’s omega block building at the anglo colombiano school in bogotá, colombia. its concept is based on a simple premise: learning by doing. the design showcases a world thought for children where color and geometry set the pace of the space. the library and the extended learning areas of the building reflect the latest educational models and take into consideration new generations and their way of interacting with spaces. appearing as a warehouse wrapped in a translucent envelope, ‘fukumasu base’ is a kindergarten that also seeks to be a community center for children and their families. realized by yasutaka yoshimura architects, the interior program accommodates children of all ages as well as their families. inside the airy volume, an irregularly shaped volume has been added that connects two floors without reaching the full height of the ceiling or touching the outer boundaries.